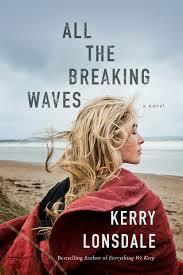 I fell in love with Kerry Lonsdale's debut, Everything We Keep, this past summer, so I knew I had to read All the Breaking Waves as soon as possible. Kerry has once again proven her strong and captivating storytelling prowess. This time around, Kerry has written a powerful story about mother and daughter relationships. The power in this case is psychic, more often than not. The story begins with Cassie's night terror involving her best friend and then escalates from that point onward, prompting Molly to re-visit her childhood home, as well as the horrible memories it evokes. She has to find a way to make things from her past right again, even with some other complications arising. Everything was easy to visualize and I could practically smell the rain in the air or taste Nana Mary's cooking. Molly's flashbacks built up the story a lot and it was interesting to piece everything together from her past. The dialogue and interactions between characters felt genuine and honest. After Everything We Keep, I was hoping for more of a shocking twist from this novel. However, there were some surprises in store that kept me on my toes. And maybe you will be shocked by some of them. Overall, this was a very impressive novel that was hard to put down, and I look forward to reading more by Kerry in 2017! Thanks to Kerry Lonsdale for the book in exchange for an honest review. She has one copy for a lucky reader! I don't know if this can be considered a psychic moment or not, but it came up in conversation with my friend Marla one day. The day that Nani started getting sick and I took her to the vet to find out she had heart failure was the same day that a box of kittens was dumped at the Petco in town. One of the kittens in that box turned out to be Kiki. Of course I didn't even think about getting another kitten for almost 2 months, but the one I chose was Kiki. She seems to have a lot of the same traits that Nani had. We think Nani sent Kiki to me because I needed someone new to love. Sometimes, when I'm half asleep I feel like someone is touching me, like some kind of windy presence floating around. I lost my Husband to Kidney Cancer 5 weeks ago & the other night about 3 in the morning I heard him call my name as clear as day. I woke up looked around & either I was dreaming or he was calling me from above. This is the first time this has happened since he passed away. I'm thinking maybe it was a way to tell me he's ok, because he has been on my mind alot every day. Thanks for this generous giveaway. A psychic moment has occurred several times through my life. I was expecting an important call from my parents and this would be something to look forward to greatly. The phone ran as i was thinking about them. Many years ago this took place. I don't know that this was a psychic moment. I think it was more of a mother's instinct. I felt that I needed to call my child that was in another state. Good thing I did. My husband and I went to get him. My daddy was dying from cancer. We have never been very close because of choices he made. I did visit him as much as I could. I live in SC and he lived in Tennessee. I was driving home and heard, for the first time, Sarah Mclaclan's song, "In the Arms of the Angets." I thought to myself that my daddy has just died. When I got home my husband told me that my uncle had called. My daddy had just died. Another 5! Sounds interesting. And I think it's very cool that you "cast" it. I am jealous of your huge knowledge of today's actors. I heard my dad talk to me after he died. These little moments happen all the time. I'll think of someone I want or need to talk to and over the course of the day, I will hear from them by email, phone, or text ... even when I haven't talked to them in a while. I don't know whether they are physic moments or not but I love it when you can be thinking of something and the next thing you know, it happens, or they call or appear , etc. I've never had a psychic experience; however, it sounds interesting. I don't think I've ever had a psychic moment other than maybe thinking of someone specific, and I get a call or text from them.